Run for cover. Copper prices are getting killed. Click the chart to track prices of copper and other commodities. 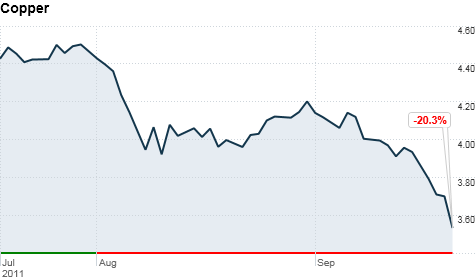 NEW YORK (CNNMoney) -- "The sky is falling! The sky is falling!" That's what copper traders must be thinking today, as prices plunged more than 7% amid mounting fears that the global economic slowdown may turn into an outright recession. Copper prices are closely followed as a key predictor of the economy since the base metal is used to manufacture goods ranging from cars to plumbing pipes. In the past two months alone, prices have plummeted more than 20%, putting copper into bear market territory, which is pretty much a blinking red light for the global economy. "We're seeing a knee-jerk reaction, as if the world is coming to an end," said Paul Simon, chief investment officer of Tactical Allocation Group. On Thursday, prices sank 7.3% to $3.49 per pound. Other commodities also plunged. Crude oil prices tumbled 6.3% to about $80.51 a barrel, while silver dropped nearly 10% to $36.58 an ounce. While sluggish global growth and a worsening European debt crisis have left investors in panic mode for weeks now, the gloom and doom intensified following the Federal Reserve's dismal outlook and signs of slowing manufacturing activity in China and the eurozone. Though the central bank has been warning of slower growth for months, its signal of "significant downside risks to the economic outlook" spooked investors. "The Fed always tries to temper the language that could frighten the market, but it's basically saying that the worst isn't over for the economy," said Keith Springer, president of Springer Financial Advisors. Even gold, which is typically perceived as a safe haven to rush into during times of fear and uncertainty, fell almost 4% $1,741.70 an ounce Thursday, signaling just how fearful investors are about the potential for global deflation. "Commodities need inflation to rise, but when you have a worldwide economic slowdown, that creates deflation," said Springer, who is also the author of Facing Goliath: How to Triumph in the Dangerous Market Ahead. "In a true deflationary environment, there's no hope for any commodity, even gold." Investors will likely slam the brakes even harder if Europe's debt crisis spirals further out of control. "If Europe completely unravels, all bets are off," said Tactical Allocation Group's Simon. "If Greece does not get restructured in an orderly fashion, Europe will be in chaos. Already, the situation is very precarious, and the behavior there is reminiscent of 2008." Though the rough patch will last a while for commodity prices, experts agree that eventually, central banks' monetary policies will spark inflation and push commodity prices higher longer term. "The central banks are going 'all in' fighting deflation, but the path they're taking by opening up the liquidity spigots will create significant inflation down the road," said Simon. "That's highly bullish for commodities."